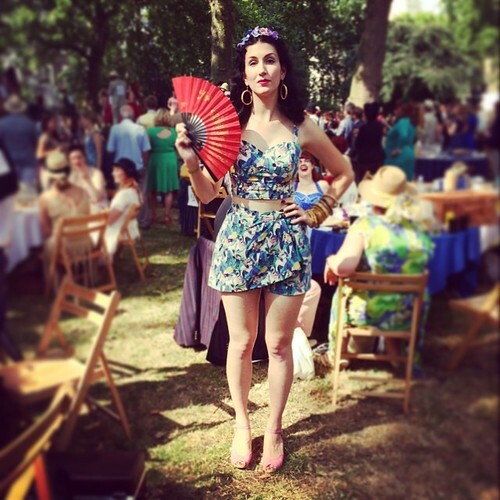 Regular readers will know that the Chap Olympiad is a major event in my summer. This year marked my sixth (I think, possibly seventh) excursion to the Chappist field of dreams and the fourth year of wearing matching outfits with my dear Vintage Mafia. We have worn Heyday Fleur dresses (twice) and Miss Bamboo, but this year it was Collectif Clothing. 2013 in Miss Bamboo dresses! I have long since given up taking photos of my own since they essentially look the same every year, but this did mean that I didn’t capture our outfits myself. My lovely boyfriend took an Instagram of me, but that’s about it. I am in love with this outfit! Luckily Chap Photographer extraordinaire and all-round lovely lady Stephanie Wolff was on hand to take some action shots of us! Jeni and I in the top and sarong shorts, Bethan in the top and skirt. My role at the Olympiad is of a helper rather than a punter. Bethan runs the show, Jeni and I manned the registration and sign-ups table in the morning, and scored the ‘Well Dressage’ contest as usual in the afternoon. Stephanie also captured this nice one of me and my darling Sean. … as well as this one of me looking slightly mad with my darling Lydia! Lydia is the bambina of my dear friend and former Mafiette Naomi Thompson of Style Me Vintage Clothes fame. What a cutie! Roll on next year – what shall we wear then?! PS Accessories fans may be very interested to know she has a new book coming out in the autumn in partnership with the other lady who knows everything there is to know about vintage, Liz Tregenza – Style Me Vintage Accessories. Exciting! What a glorious day! I always love to see the VM matching outfits! This all looks fantastic. Seriously, you Brits get all the cool stuff. And I love the Vintage Mafia and your matching outfits, you all look beautiful, and like you're having a really great time. I really love these looks! Can't wait to see more!